An unforgettable experience awaits you while discovering the west coast. 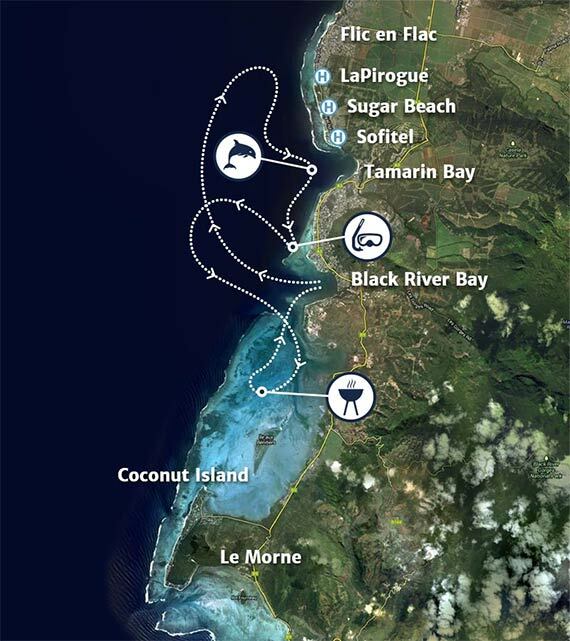 Starting from Black River Bay, we will sail along the coastline to Tamarin Bay where the dolphins are seen. We will take you on a breathtaking snorkelling trip outside the reef of La Preneuse where you will have the opportunity to feed the fish in their natural habitat. We will then sail to the coves and stunning lagoon of Le Morne, where you will relax and enjoy a mouth-watering seafood barbecue in total comfort next to the Benitier Island.